Installing new windows was a significant chunk of our budget that we decided to do now instead of later. Here's why. Firstly, security purposes. The old windows had to have been from the '70s or '80s. The glass was thin, frames were rusty, and the hinges and screens were flimsy. A few of the windows were even made out of plastic and the window on the backdoor was boarded up with wood. We would have been prime victims for a break-in. Another reason was insulation and soundproofing. The freeway is basically in our backyard, and with our old windows, we were getting quite a bit of noise and improper temperature regulation. New, double-paned retrofit windows would help solve that. And then of course, resale value. Like many of our remodel decisions, we want to make sure that our improvements will also be profitable when we eventually sell the house. New windows will add a ton of much-needed curb appeal. After researching and contacting at least 15 different window companies and receiving quotes back in December, we decided to go with Window Design Group. It was very difficult to find a reputable company with flawless reviews, and to be honest, it hasn't been the most pleasant experience. But overall, we're happy with our decision because the price fit our budget and their quote included helpful, organized details like all the measurements and window materials. They sent an installer out to measure the windows for the initial quote. After we revised it a bit and had final measurements taken, we put down a deposit and placed our order by February. 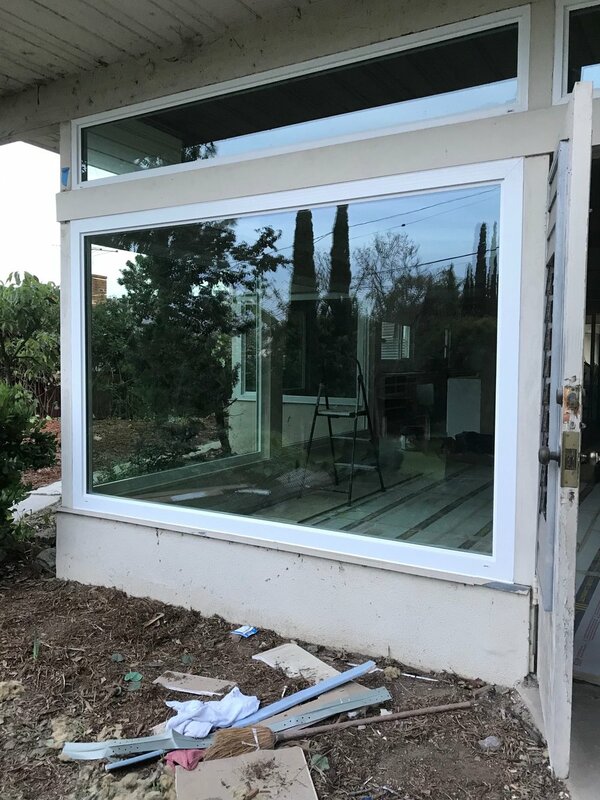 It usually takes about 3-4 weeks to actually make the custom windows so we were very excited when our sales rep told us that they would be ready to install by mid-March. Turns out, it was too good to be true. Our new windows weren't installed until the beginning of April, and we're actually still waiting for two of them to be installed. One of the biggest hold-ups was our sliding patio door. Our contractor noticed that the quote didn't include the metal waterproofing pan that goes along the sliding track — a detail that would be required for our final inspection to pass. After A LOT of back and forth because they didn't seem to understand what we were requesting, our contractor finally decided to install the pan himself. As of this morning, I had to book a date for the final installation of the sliding door, but their earliest available appointment is next Monday morning. Like I said... not the most pleasant experience, but we're happy with the results so far. Of course, we'd probably feel a little differently if we weren't on such a tight timeline. We were aiming to move in by the end of March, but the timeline has been pushed farther and farther back. Now it feels like moving in at the end of April is wishful thinking. But at the end of the day, we'd rather have the job done right than rushing it and making mistakes we'll regret.